Capital Caterer & Decorator provides catering and decoration services for weddings and other important functions. 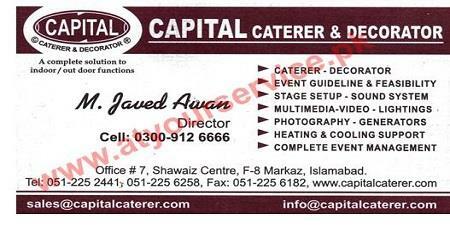 Capital Caterer & Decorator is located in Shawaiz Center, F8 Markaz, Islamabad. It provides catering and decoration services for weddings and other important functions like Conference, Meetings, Seminars, Aqiqa, Dholki, Mehndi, Barat, Valima & Other ceremonies.